With a rich history of consulting with and training Fortune 500 executives and his expertise in leadership personality evaluations; Dr. Allen now offers his unique skills to help small business and NP leaders bring QM to the millenial workplace. 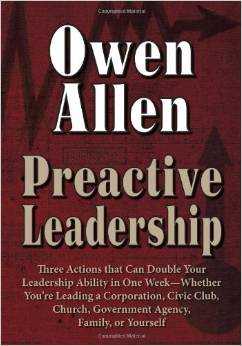 Dr. Allen is an author, lecturer and expert in organizational development. As a professor of management and academic dean he has written accredited graduate level management programs. Before entering the academic world, he was the president of an international consulting firm that conducted management training and research in fifty (50) countries. He has consulted with many large enterprise businesses including General Motors, General Electric, Kraft Foods, and Hilton Hotels as well as a variety of local, state, and federal government agencies including NASA. More than thirty thousand (30,000) executives and managers have participated in his seminars. Dr. Allen describes a leader as anyone who regularly influences others; and he emphasizes the importance of having a positive impact on people and influencing them without conflict. This easy-to-read guidebook tells exactly what to do (and what not to do) to be a result-oriented, conflict-free leader. It reveals two basic kinds of leadership: preactive leaders who act before trouble starts, and reactive leaders who act after trouble starts.